Everyone likes stormtroopers. The sleek helmets, the cool armor, and - of course - the numerous varieties. New rumors for Star Wars Episode VII hold that a new type of stormtrooper-like foe will be making an appearance in the movie - an entirely chrome version. 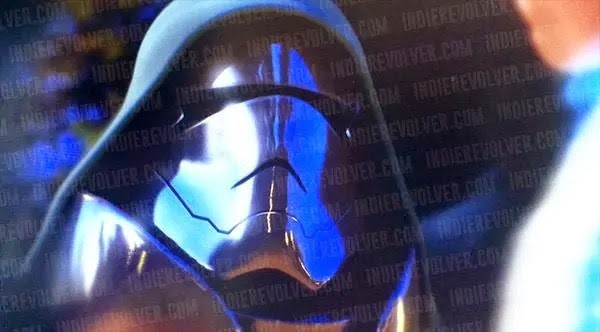 The unique qualities of these new chrome troopers remain to be seen - but it has been predicted that they may possess stealth "cloaking" technology. If the rebels get stealth x-wings, why shouldn't the Imperials get stealth stormtroopers? Bring these guys into your Edge of the Empire or Age of Rebellion game with the stats below. Not just any grunt is given the incredible rare and valuable chrometrooper armor. This cutting edge technology is saved for the cream of the crop, represented by the trooper's "rival" status, and Advesary attribute. The ability to sneak up on PC's undetected, combined with their heavy weaponry and honed combat skills makes the chrometrooper far more than simple canon fodder. 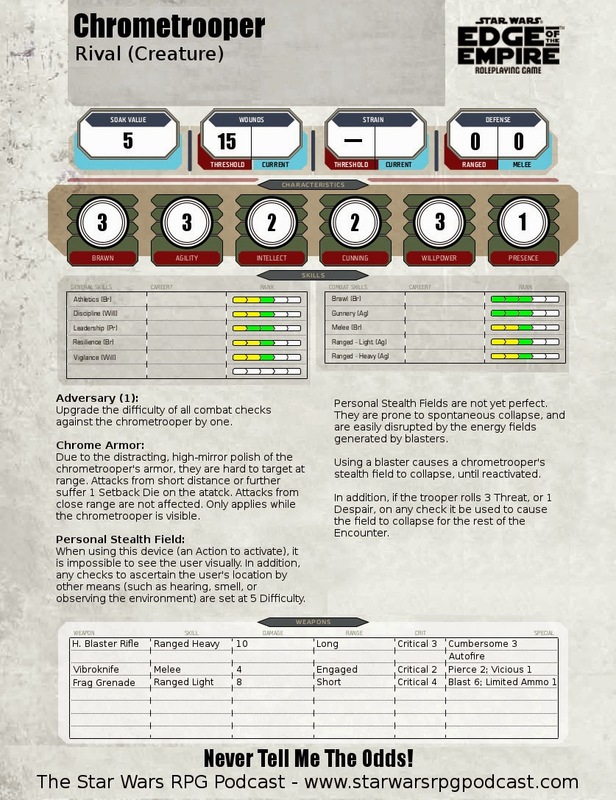 A savvy GM might use the chrometrooper judiciously as a lone sniper, as part of an elite hit squad, or as high-level security for sensitive Imperial locations. In any case, they should be used to harry the PC's throughout a play session, instead of expended in one encounter. Even when visible the chrometrooper's Chrome Armor attribute grants them additional protection from enemy fire, even while not cloaked. As such a chrometrooper's tactics are likely to focus on attacking from range, and disappearing when threatened up close. Planned cleverly, a single chrometrooper could quickly become more than an unlucky, or unwary, party can chew. A final note: if the PC's recover a chrometrooper's armor for their own use, consider modifying the spontaneous collapse condition as follows: On a roll of Despair, the personal stealth field suffers critical meltdown, and cannot be used again until costly, and highly-technical, repairs have been conducted. This may be an adventure in itself, as those with the knowledge of how to repair personal stealth fields are few and far between.